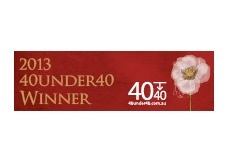 Congratulations to our director, Charles Klvana on being award one of the Top 40 under 40 business entrepeneur awards for 2013! The 40under40 2013 Gala Awards were held at the Crown Perth, on 13 March 2013. Close to 1000 guests attended the exciting evening, held in honour of Western Australia's top 40 business entrepreneurs and professionals under the age of 40.